Khun Phaen Hnaa Tong (Pra Khun Phaen with gold face) Hlang Yant Takrut Tone (with Yant Takrut Tone spells and Takrut Tone scroll insert) - Fang Pra Nakprok (Pra Nakprok Buddha insert) - by Luang Por Tone - Wat Khao Noi Kireewan. Issued and empowered as Luang Por was still Living in the time circa 2525. Sacred powders are visible on the rear face, which is not gold covered. They were made in various powder mixes, including Nuea Pong Prai Kumarn Dam, and Nuea Khaw Pong Puttakun. Because of the Nakprok, this Khun Phaen will be especially powerful for those born on a Saturday, but is of course a powerful amulet of great fame in any case for any person as well. You can see the 'fingerprint' markings from the hand pressing of the amulets on the rear face. 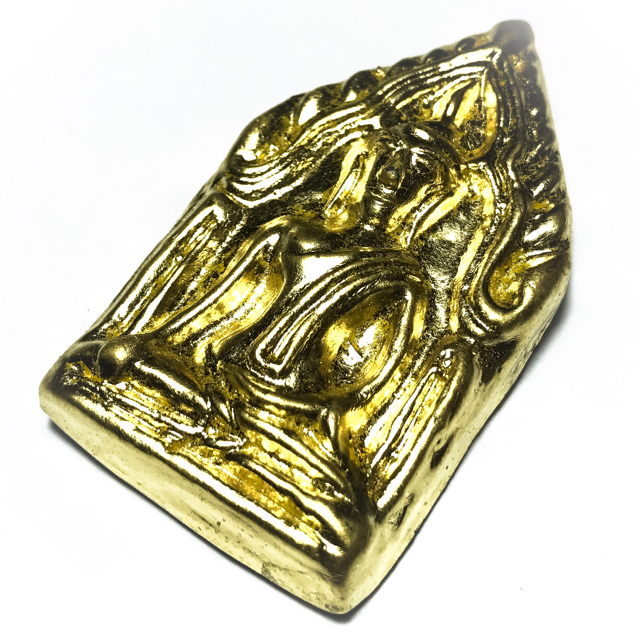 A Essential Rarity, this is a classic and powerful Pra Khun Phaen amulet with the finest of Sacred Powder ingredients, from one of Chonburi Province's Great Legends, Luang Phu Tone. Luang Por Tone is of course one of the direct Looksit to Luang Phu Tim, which can be seen in his magical amulets. He is becoming one of the high end collectors finer acquisitions, whose amulets are now extremely rare, despute the fact that they have not yet reach the price level of the amulets of Luang Phu Tim. He is less famous in International Waters than Luang Phu Tim's other Prime Looksit Luang Por Sakorn of Wat Nong Grub, but his amulets are rarer and demand a higher investment to acquire one of his amulets. Luang Phu Tone was born in 2466 BE on a Monday, as the son of Mr. Kim and Mrs. Daeng, with the surname 'Leuang Orn'. His parents were Market Farmers. When Luang Phu became old enough to begin studies, he was sent to learn at Wat Nern Sangkh temple school, and remained at the school until finishing Primary 4th Grade. Luang Phu Tone ordained at the age of 30 on the 14th May of the Year 2495 BE, at Wat Nern Sangkh Saritaram, in Tambon Rai Hlank Tong, in Chonburi. His Upachaya Ordaining Officer was the great Luang Por Tong Hyib, the abbot of Wat Bote, and Pra Atigarn Iam was his Gammawajajarn Prompting Officer, and Pra Luang Por Bpom was his Anusawanajarn Witness.both monks coming from Wat Rai Hlak Tong. Luang Phu was given the monks Surname (Chaayaa) of 'Gandtasilo' which means 'He who has perfect precepts'. Luang Phu Tone is renowned to have Witayakun Powers to perform Buddha-Magic using Psychic Ability. This is considered to be the difference between a Monk who can Invoke and Summon Powers through the use of Incantations, and a Monk who can Imbue Magical Power which arises through his own Psychic Abilities (Abhinya). Because of his rare abilities with Psychic Empowerment, he is often called to the Major Buddha Abhiseka Ceremonies around the country to assist in empowerment of amulets, and installation of Buddha Images. He was almost always seen to be present in all major ceremonies of the Chonburi Province Lineage Temples, where he was seen as an essential member of amulet empowerment ceremonies. Luang Phu Tone is also renowned for another special ability which is not common, that of 'Sek Nam Mont Prasan Graduk' - Empowering Holy Water with Incantations to heal Bones. He also is Adept in prevention of Black Magick, for he himself learned the methods of making Ya Sang Khao Tong Poison Potions, Curses using Human Hair, and of Projecting Tapu Loeng Sop Coffin Nails into the stomach of a victim. All Adepts of White Magic should learn the methods of Black Magick, for prevention purposes, and Luang Phu Tone has mastered both Paths. In olden days, when somebody wished to kill somebody, and knew the secrets of Wicha Akom Sai Lang Dark Arts, they would not need to use a weapon to succeed. They would use the infamous 'Ya Sang', a Sorcerous Potion based both in natural poisons extracted from forest plants and roots, and other substances, along with Magical Substances prepared using dark Arts, which when mixed into a potion, becomes a deadly and untraceable weapon, which can kill a person at a distance, by adding some of the Ya Sang to their food or drink. Some Ya Sang can be smeared on the person and will also work to make the person ill, insane, or even cause death. It is not possible to find traces of Ya Sang, because of the use of unknown ingredients, and the fact that the main source of the damage comes from the Magical Incantations performed on the potion. Luang Phu Tone is an Adept Master of both 'Phuug Ya Sang' (making the cursed potion) and 'Gae Ya Sang' (heal the curse). Luang Phu Tone was apprenticed to the Great Luang Por Tab of Wat Hua Thanon, in Psanikom, Chonburi, who was one of the Greatest Masters of Kata Akom of the Chonburi Province. he was also a student in Magic to the Great Luang Por Do of Wat Na Madtum, who was also one of the most famous Masters of the time, especially for his Wicha See Pheung Metta Balm. Luang Phu Tone Gandtasilo was also a Master of Tudong Practice of the 13 Tudong Methods in Forest wandering. He traveled in solitary through the forests right up to the northern Lanna regions bordering Laos and Burma, for a period of 32 Years! Friends with Luang Phu Tim (Wat Laharn Rai) - The Building of Wat Khao Noi Kireewan. Khao Noi was a high hill with deep thick forest covering it, and was a very quiet place removed from hustle and bustle of the world. Luang Phu surveyed the hill and decided it would be an apt place for practicing the Dhamma and Meditation. During the time he was still living, Luang Phu Tim always gave encouragement and support to Luang Phu Tone, in his Projects. Luang Phu Tone wold often visit Luang Phu Tim and stay at the temple with him for periods of a month or two at a time, and gather Wicha and Experience with the Great Master. Luang Phu Tim would also always invite Luang Phu Tone to practice empowering amulets with him, to make his own, and also always gave Luang Phu Tone many of his own amulets to take back to Wat Khao Noi Kireewan to distribute to his devotees. Luang Phu Tone says that every single Wicha and Method of Magic that Luang Phu Tim had explained to him, had all brought results and worked as expected, and that he has based his empowerment on the successes which have been received using the techniques he learned from Luang Phu Tim. Luang Phu Tone arrived to begin his latter life's work of temple building at Khao Noi on the 23rd May 2512 BE, and at first stayed in the forest with his meditation umbrella and mosquito net, until the first Kuti Hut was built by the first Folk of Khao Noi who noticed Luang Phu's presence and were filled with faith in his practice. A small Kuti hut was built for Luang Phu to reside in. From one smnall hut in the forest, Luang Phu managed to develop into a temple, and build many ancilliaries, and now the temple is officially registered in the state registry and with the Sangha committee as a fully fledged Buddhist Temple. To this day, Luang Phu continued his work to improve and expand the temple, working on the construction of an Uposatha Shrineroom (Chapel), which is still in progress, due to Luang Phu's passing before it was finished. Luang Phu Tone passed away on the 30th April 2551 BE, leaving his devotees heartbroken. As usual with the passing of a Great Monk, the amulets of Luang Phu Tone were fast snapped up by devotees and collectors alike, and now they are incredibly rare to find. His Pra Kring and Pra Khun Phaen Song Phol amulets are among the most highly sought after, for their power to bring good Business and Wealthy Windfall,s and Maha Sanaeh Seductive Influence, and Metta Mahaniyom Mercy Charm. They are also in addition, aesthetically very pleasing to the eye, and can be considered one of the most beautiful Khun Phaen designs.